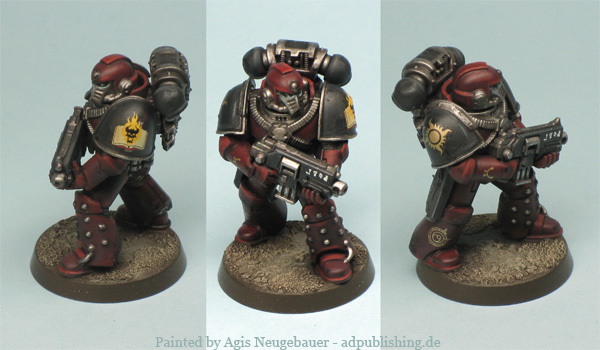 The Word Bearers, originally known as the Imperial Heralds, were the XVII Legion of the original twenty Space Marine Legions. 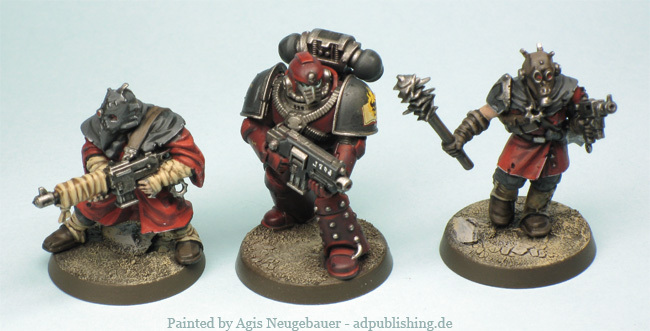 They were the original of the nine Legions which betrayed the Emperor, becoming the first known Chaos Space Marines, their allegiance pledged to their Primarch Lorgar and to Chaos as a whole. Marines from the Battle of Calth box with FW decals, a nice collaboration of Scarsminis and me. Peter really is the man, he followed my colour scheme from the mini below 100 %! Marine from the Battle of Calth box with FW decals, I tried some speed painting techniques on him. Mostly base colour wash 1 highlight. Same goes for the Execution force Cultist. I am planning to use them as Cultist for Execution force, Word Bearers and Thousand Sons. The Execution force Cultists are done, another great collaboration of Peter and me. I am planning to use them as Cultist for Execution force, Word Bearers and Thousand Sons.